When talking about marketing, we are often so focused on looking for ways of reaching our target audiences that we rarely consider how to do so efficiently. During my career, I’ve witnessed time after time marketers starting far more work than they are able to finish, priding themselves on how busy they are all the time. This usually came hand in hand with a messy work process, blocked tasks and team members, as well as accumulation of stress when deadlines started knocking on the door. This recurring event is largely due to the common management strategy of aiming to achieve maximum resource efficiency with little regard for flow efficiency. If you are not familiar with these two terms, you’ll find the rest of the article truly valuable for optimizing the way you organize your work. Resource efficiency and flow efficiency are two sides of the same coin. Both are performance indicators related to how you manage your team and your process. Resource efficiency is how much of the capacity of your marketing team you put to use. Following this line of thought, to achieve maximum resource efficiency, you need to keep yourself or your team (depending on the level of responsibility) busy 100% of the time. At first thought, this seems like a pretty good idea for achieving vivid results and justifying your budget and salary. In reality, keeping everyone busy all the time can prove to be counterproductive, especially in an agency environment. Most agencies, and marketing teams in general, work on multiple projects simultaneously. It is an inevitable part of the marketer’s job whether we like it or not. Even the most simple campaigns require a team consisting of multiple stakeholders like a copywriter, designer, copy editor, etc., who are responsible for executing the different parts of the project. When you are trying to keep all of them busy, the logical thing is to give new work to each person in advance, so they can start processing it as soon as there is nothing more they can do on their current assignments. This would work perfectly if there was no chance for a task to be returned for rework (which is almost never the case). In reality, as soon as the copywriter is done creating the content, she will move on to the next task in her backlog because there is nothing more she can do until the editor is done reviewing the assignment. In the meantime, the designer has nothing to do on this project yet so he starts working on something completely different. While the writer is preparing the next piece of content, her first task is returned for rework, so she has to either leave everything at hand and fix the issues or the assignment has to accumulate some wait time. Eventually, the assignment for the designer on the campaign becomes ready to start, but she, on the other hand, has no capacity because she is still working on the previous task on her backlog. Either way, everyone is busy but the campaigns at hand are not progressing at optimal speed. Flow efficiency is the ratio between value-adding time and the lead time required to complete a process. Optimizing your process for flow efficiency allows you to organize your overall capacity to deliver maximum value to your end customer in the shortest possible amount of time. It is almost a sacred metric for teams practicing Lean marketing. When optimizing your process for flow efficiency, your goal is not to keep every person on your team constantly busy, but to keep all aspects of the campaign moving through your workflow. To achieve maximum flow efficiency, you need to have capacity available all the time (slack). As a result, when one part of a campaign is completed (e.g. content) and it is ready to move to the next stage (let’s say design), a team member is ready to start working on it immediately. On the other hand, if there are changes to be made to the copy, the content writer is ready to start immediately, because she hasn’t rushed to begin new work immediately. From a customer point of view, optimizing your process for flow efficiency is more important, as you will be able to deliver your service faster and very likely with better quality. You might ask why. Because your team will be focused on a single project and their entire attention will be channeled towards the tasks that comprise it, leaving a minimum chance for mistakes caused by frequent context switching. On the other hand, from an economic point of view, optimizing your team and your process entirely for flow efficiency might not seem like a wise idea, because your skilled and highly paid experts will not be utilized to their full capacity. So how can you get the best from both approaches to managing capacity? Like pretty much with anything else in life, creating a balance can get you far when optimizing your process for both resource efficiency and flow efficiency. When calculating the resource efficiency, we take into consideration how much of the work week each person spends actively doing their job. So we divide the hours spent actively working (e.g. 30) by the 40 hours that comprise the standard workweek. Then, we multiply the result by 100 and learn that the person has been 75% efficient during the week we are analyzing. When calculating flow efficiency, we focus on the time that it takes to process a campaign after it has been requested by our customer. Value added is the time when a team member is actively working on the campaign (e.g. creating copy, designing brochures, promoting on social media, etc. ), while lead time is the total time between request and completion. For example, if a campaign is completed in 90 days, but the value added time is only 30 days, then by using the above-listed formula, it appears that the flow efficiency is 33%*. Even if our team is fully utilized but the efficiency of our workflow is low, our efforts will not be bringing the optimal value for neither us nor our clients. 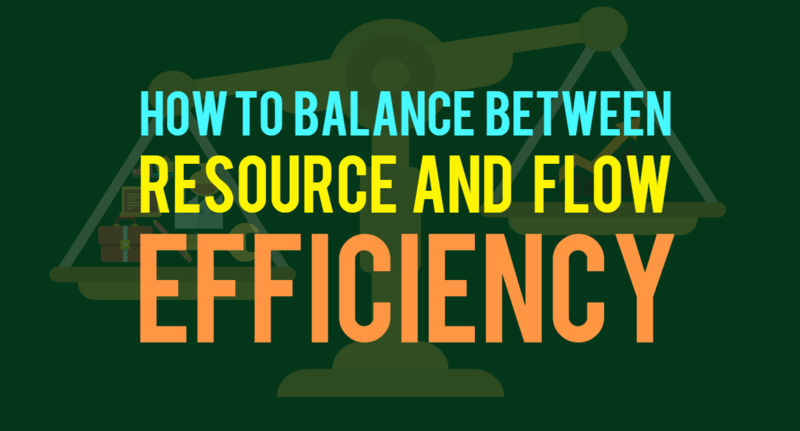 So to optimize your work process for both resource efficiency and flow efficiency, there are 2 steps that you can take for maintaining а balance. Visualization is an invaluable weapon for managing a team. Especially in a dynamic environment such as marketing because when you visualize all assignments, it is less likely to accumulate humongous amounts of started but unfinished work. 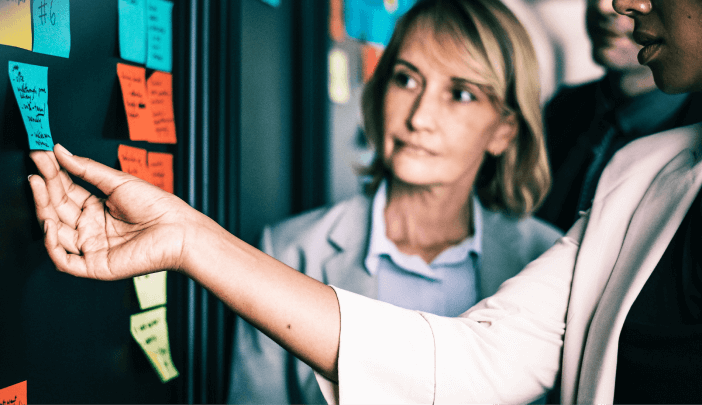 There are hundreds of ways and tools available for task management, but if yоu have been working only with personal To Do lists to this moment, I suggest you start with something simple like a Kanban board. It is quite easy to use. You just dedicate any kind of a vertical flat surface (e.g. whiteboard, wall, window, etc.) for the purpose and draw a few horizontal lines for the different stages of your process. For example, you can start with a basic layout consisting of just 3 columns: To Do; In Progress; Done. Then, you put all tasks and their assignees on cards across the board depending on their state of completion. When the status is updated, you replicate it on the Kanban board. It will be more than enough to make it transparent how many things each person on your team has in progress and how busy they really are. Of course, the more detailed you draw your board, the more comprehensive visualization you will get. Just to give you an idea, I will mention that our current marketing Kanban board consists of 17 columns for every step of our process that we deem significant enough to mention. Limiting your work in progress (WIP) will allow you to optimize your capacity and find the right balance between resource efficiency and flow efficiency. The logic is quite simple really. You place a limit to the total amount of tasks that can be in progress simultaneously and forbid starting new work until there are available slots for more tasks. According to Little’s Law, by reducing the amount of work in progress while maintaining your average completion rate of assignments, you will be able to reduce the lead time of your campaigns and therefore improve your flow efficiency. Depending on how strict limits you place, your process will become more optimized for either resource efficiency or flow efficiency. For example, if you allow each team member to have just one task in progress, they won’t be able to start new work until their current assignment is done and therefore they might have plenty of unused capacity while waiting for review by other stakeholders or customers. On the other hand, if you put very liberate WIP limits that allow team members to work on multiple tasks at once, they will surely be busy all the time, but the flow efficiency will suffer as a result. So the key to balancing both resource efficiency and flow efficiency is to find the sweet spot where the limit allows team members to have some flexibility to maneuver between tasks but little room for frequent context switching, so each person can utilize their capacity at high percent and yet not harm the overall flow efficiency of the campaigns at hand. There isn’t a golden rule for finding and maintaining a balance between the two performance metrics, but with the knowledge you gained by reaching the end of this article, you should have the necessary guidelines to find what works for your team best. In conclusion, I’d like to provide you with one last piece of advice; When you begin experimenting with different WIP limits, start where you are and slowly tighten them. Monitor your performance metrics and adjust according to the results. This entry was posted in Kanban on September 17, 2018 by Alex Novkov. Well-written. Concise, and good use of examples.